While the aperture controls the amount of light that touches the sensor the shutter speed controls for how long. This means that if you use the aperture and the shutter speed together you can take pictures with many different lighting conditions. Open the aperture more and let in more light and you might have to speed up the shutter speed to reduce the amount of time the sensor is exposed. Guessing at this would be next to impossible but with a light meter built into your camera it is pretty easy to set the camera correctly. Since we have a light meter and it tells us how to set the camera why not just let the camera do all the work by putting it on program mode or auto? In some cases that might be the easiest option but if you are after a certain effect then you need to be in control. Just like with the aperture the shutter speed controls more than just light. With aperture it is the depth of field but with shutter speed it is how clear or blurry the image is. If we look at the photo at the top of this post we can see that the children running are frozen in motion. This was shot from a moving car as the children ran along beside it. To freeze everything the shutter speed had to be pretty fast. How fast? 1/1250 of a second! The shutter could have been slower but not too much slower. This all depends on how close you are to your subject, what lens you are using, the speed at which subjects or you are moving and the amount of light. The aperture and ISO were set to get a correct exposure with the aperture at f5.6 and the ISO at 200. The lens used was a 12 to 24mm zoom opened up at 12mm. If we slow the shutter speed way down then we are not going to be able to freeze the motion. In this picture above the lights of the cars racing by are like lines painted onto the picture. Everything else looks clear and frozen and that is because the camera is not moving. The key is to have the camera on a tripod so that everything is frozen except the lights of the cars. The shutter door was left open for a full 13 seconds. In order to leave it open that long the aperture had to be closed way down to f25 with an ISO of 200 and focal length of 40mm. 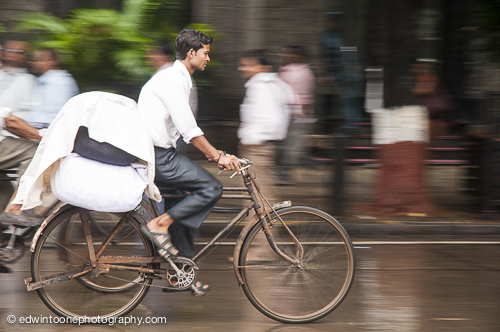 If we take what we know about objects moving in front of a slow shutter speed and have the camera follow the object we get a picture like the one of Indian delivery man as seen above. Instead of the subject being blurred like the cars in the night shot the background is blurred while the subject is much clearer. Getting an image like this comes knowing your camera, practice and a little luck. A standard indicator for how slow can you go and still have a clear non-blurry shot is 1/60 of a second, and this is if the subject is not moving and neither are you. So for this shot the camera was set at 1/50 of a second, F5, 70mm and an ISO of 200. 1/50 of a second is not a magic number and making shots like this take some trial and error. A good way to practice is to go to a road and try shooting moving cars as they pass. Pan the camera while taking continuous burst of photos. If your camera does not have a continuous shooting mode you will have to practice more to get it exactly right. This picture was one of three and the other two were pretty much garbage. 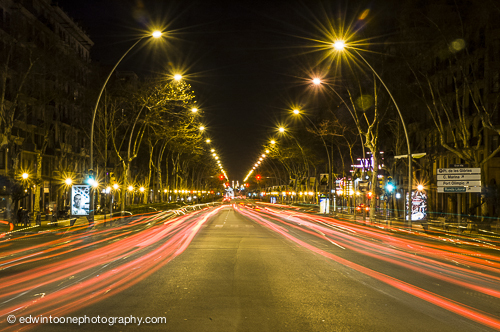 Experiment, try different focal lengths and shutter speeds until you get something you like. Even if you don’t get it exactly what you think you want, sometimes the results are pleasing. When I shot this I only had seconds to get the leaders of the race passing by, I knew I wanted to show the motion and I had not gotten the desired results earlier in the race with other shutter speeds. So, I really slowed things down and shot at 1/4 of second, f16, ISO of 200 and focal length of 18mm while following the runners with the lens as they passed by. 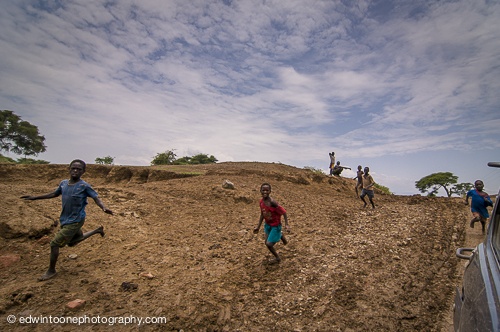 I probably took between 6 and 10 photos as they ran by with the camera set to a high speed continuous shooting rate. When I saw the results on the back of the camera I was not sure so I kept shooting other runners with different settings. 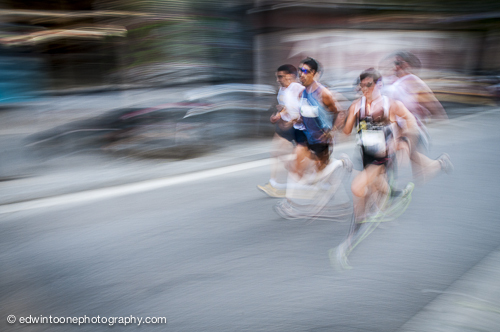 Once back at home in front of a big screen I could see that none of the images had the runners as clear as I was shooting for but this particular image jumped out as having real feeling of speed and competition within a tight group racing across the frame and I knew it was a keeper.